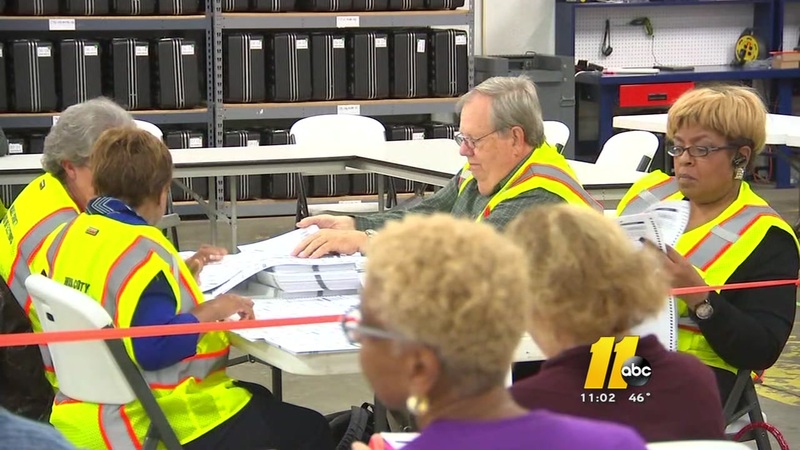 DURHAM (WTVD) -- As counties across North Carolina continue to count absentee and provisional ballots, Roy Cooper's campaign said Friday his lead over Pat McCrory has grown to more than 7,400 votes statewide and is expected to get larger. County canvasses were supposed to be done by Friday, but all have been delayed at least until next week. Campaign attorney Mark Elias said on a conference call Friday the McCrory effort is in "total collapse." But McCrory's campaign said not so fast. "Let's be clear: the counting is not complete and there is still no certified outcome. Roy Cooper is making presumptuous statements based on piecemeal results from a handful of Democrat-leaning counties in order to deflect attention away from serious voter fraud concerns that are emerging across the state," offered campaign spokesperson Ricky Diaz. On Friday evening, the Durham Board of Elections announced that it had received four additional election protests. All four protests were filed by John Posthill, a voter registered in Durham County. The protests make allegations that ineligible voters cast ballots, that ballots were improperly scanned, and that absentee ballots were improperly cast on behalf of another. The Board of Elections said it will give preliminary consideration to these protests as part of its county canvass, which will continue Monday at 5 p.m.
Thursday, the McCrory campaign filed 50 new election complaints with the state board of elections. The governor is alleging votes were cast by dead people, convicted felons, and some people who had already voted. The new complaints came on top of protests claiming irregularities related to absentee ballots filed in a dozen counties - bringing the total number of counties statewide dealing with challenges to 52. "The real question people should be asking is, 'Why is Roy Cooper fighting to count the votes of dead people and felons?'" Diaz charged. Elias claimed Friday that the McCrory campaign is defaming people by calling people felons when they are not. He called the Republican challenges "frivolous" and a "waste of taxpayer dollars." Elias said challenges were rejected by Republican-dominated county election boards in Halifax, Forsyth, Warren, and Mecklenburg. The Durham County Board of Elections voted Friday to deny a petition requesting a recount of early voting ballots. The unanimous vote by the two Republicans and one Democrat on the board came after Republican lawyer Tom Stark filed a formal protest alleging malfeasance in counting the votes. He voiced concerns about the late addition of 94,000 early voting votes on Election Night which tipped the balance of the North Carolina governor's race to Democratic challenger Roy Cooper. Durham board chairman William Brian said Tuesday that a software glitch forced staffers to manually enter ballots cast before election day hours after polls closed Nov. 8, and that's why the early resulting results came in so late. Brian says results were spot-checked that night, and Durham County voted heavily for Cooper both before and during Election Day. READ MORE: How close are we to a result for NC's governor?